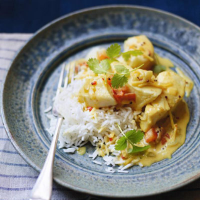 This curry recipe is full of fresh, aromatic flavours. Make with any firm white fish such as cod or haddock, try with chicken, or make this vegan and use a mixture of vegetables. Heat the vegetable oil in a medium saucepan. Add the chopped onion and mustard seeds and cook over a low to medium heat for about 8 minutes, until the onion is soft and light golden in colour. Peel and grate the ginger and add to the pan, then add the ground cumin, coriander, turmeric, garlic and chillies. Cook, stirring frequently, for a minute or so, until the aroma of the spices is released. Add the tamarind paste, chopped tomatoes and coconut milk to the pan, then pour in 100ml water. Bring to the boil, then simmer gently for about 10 minutes, until thickened slightly. Season to taste. Tip the fish into the pan and cook for 2–3 minutes. When the fish is just cooked – it should be opaque – remove from the heat. Serve at once, accompanied by steamed rice and scattered with the coriander.